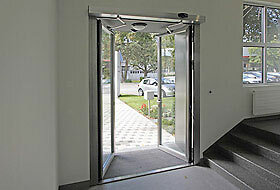 Automatic swing doors are very practical: they close securely and are easily installed. Existing manual doors can be rapidly automated without complication. Swing doors increase convenience and provide barrier-free access for the disabled. hotels, restaurants, shopping malls, shops, office buildings, hospitals, care homes, schools, theatres and concert halls. In the case of visible drive solutions the drive box and the linkage can be seen externally. They can be quickly connected to existing conventional doors with little effort, which makes them an ideal solution particularly for retro-fitting to doors in public buildings, for example. Push & Go: brief pressure from the hand is sufficient to make the door leaf open automatically. Door closing function: simple manual operation is possible during a power failure. Air-lock and porch function: two coordinated doors control access or prevent the exchange of air between the interior and the exterior. Access control: access to the building is monitored by a key, badge, video or biometric data. Building automation: integration into existing building management systems possible. Two independent movement sequences: two movement sequences can be programmed which are independent of each other and which can be activated using different encoders. Wind exposure / environmental influences: the movement sequence remains unchanged and is quite independent of changes to the temperature and wind.